Do you love the idea of a more natural cleaner for your home, but dislike the smell of plain white vinegar? I know I do, but I have to use it all the time. Between cleaning countertops, coops, and rabbit cages, I find myself going through a lot of vinegar. Vinegar is almost the only cleaner you would ever really need, and it is very cheap compared to brand name cleaners from the store. Research has proven that vinegar does clean as well as many anti-bacterial cleaners, but clorox and lysol will still kill a few things that vinegar doesn’t. Overall, I think we really over use chemical cleaners, and should save them for specific uses. If you are cooking with raw chicken, eggs, or the flu is running through your household, I might still say use the stronger cleaner, but only in specific cases. I keep some lysol on hand for times like this. No, you aren’t going to see a step-by-step because I didn’t think to take the photos, but it is so easy. All I did was cut the lemons into slices and stuff them into the jar. 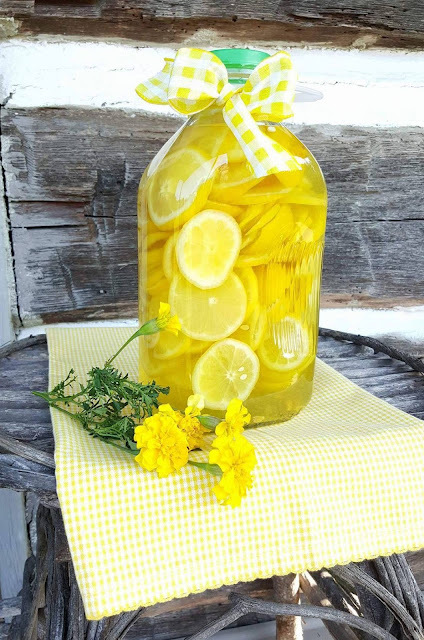 Then, I poured white vinegar into the jar, making sure to completely cover the lemon slices. I tried to remember to shake it every few days, and I kept it in a dark, cool area. After 2 weeks, I opened the jar, and the vinegar smell was completely gone! I transferred the lemon vinegar to a spray bottle, and decided to pour more vinegar over the lemons and do it again. You can also use lemon peels, leftover squeezed lemons, oranges, limes, or grapefruit. I try to purchase dairy milk, which comes in these beautiful glass jars, and they have so many great uses. I have a small collection of them, and I use those to age the vinegar. I love using this cleaner, knowing that it is not full of chemicals that would be dangerous to my family or my animals. Plus, I think the jar is beautiful, and it looks lovely on my countertop. 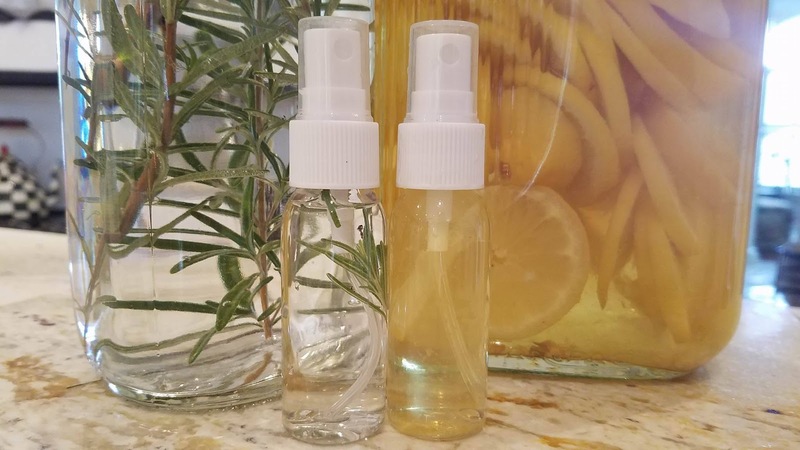 I also purchased these tiny spray bottles to keep in my car or purse for cleaning shopping cart or basket handles, and even restaurant table tops that don’t look very clean.